This website allows the public to query a map of selected reported call types. CrimeMapping also offers some useful graphs of the data. The University of California Police Department is pleased to make this resource available to the members of the UC Berkeley community. While we continue to work hard to provide accurate and up-to-date information, the data are preliminary and may change upon investigation. NOTE: Hate Crimes do not have a distinct offense code and therefore, cannot be specifically displayed. The University of California Police Department, Berkeley cannot give any guarantees as to the accuracy, completeness, or timeliness of the information. Moreover, because the information is evolving, it cannot be used for comparisons over time. The University of California Police Department is not responsible for any error or omission, or for the use of, or the results obtained from the use of this information. All data visualizations on maps are approximate and attempts to derive specific addresses are strictly prohibited. Any use of the information for commercial purposes is strictly prohibited. 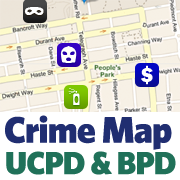 For an optimized view, iPhone users should use the free CrimeMapping.com Mobile App. Search for "California" / "UCPD Berkeley" to see criminal incidents in our jurisdiction. Search for UCPD Berkeley to see recent criminal incidents on a map.